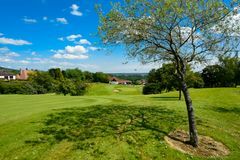 Radyr is one of the most picturesque courses in southern Wales, with superb views over Cardiff and across the Bristol Channel. The gentle undulations of this parkland track make it pleasant to play, and although it is not long by modern standards, it is undoubtedly challenging. The course was designed and constructed by Harry Colt, who includes the glorious Sunningdale in his list of creations. Every single hole is very distinctive at Radyr, making it an interesting experience for all those fortunate enough to visit during a Cardiff golf tour.